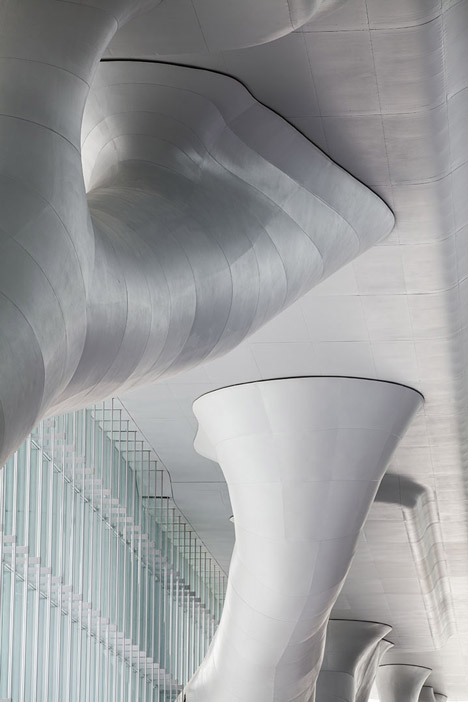 Gigantic tree-like columns support the overhanging roof of the Qatar National Convention Centre by Japanese architect Arata Isozaki, captured in these new shots by Portuguese photographer Nelson Garrido. 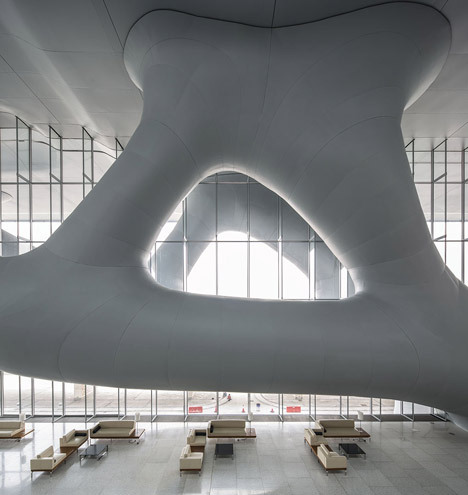 The building was designed by Arata Isozaki to reference the Sidrat al-Muntaha, a holy Islamic tree that is believed to symbolise the end of the seventh heaven. 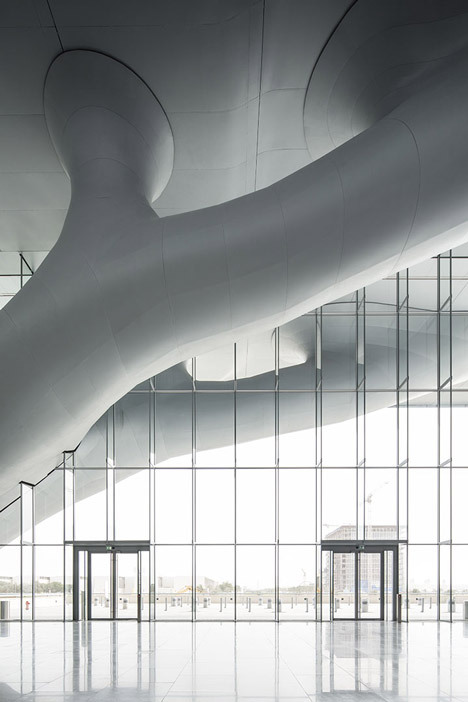 A pair of sprawling steel columns create the illusion of two trees in front of the large rectangular glass facade, supporting a roof canopy that extends out to offer shelter to a public plaza in front of the building. “The tree is a beacon of learning and comfort in the desert and a haven for poets and scholars who gathered beneath its branches to share knowledge,” said the architects. 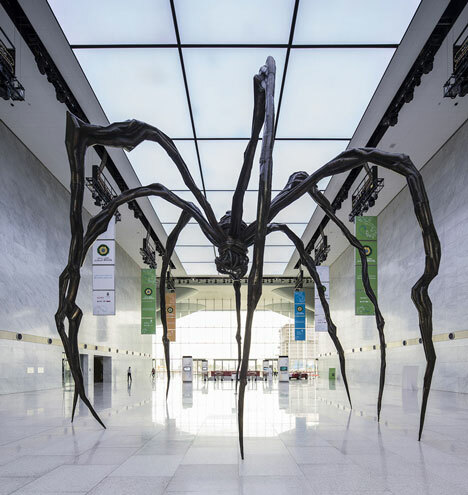 Located on the 1000-hectare campus of the Qatar Foundation in Doha, theQatar National Convention Centre opened to the public in December 2011. It is the largest exhibition centre in the Middle East and can accommodate up to 7000 people in its three main halls. 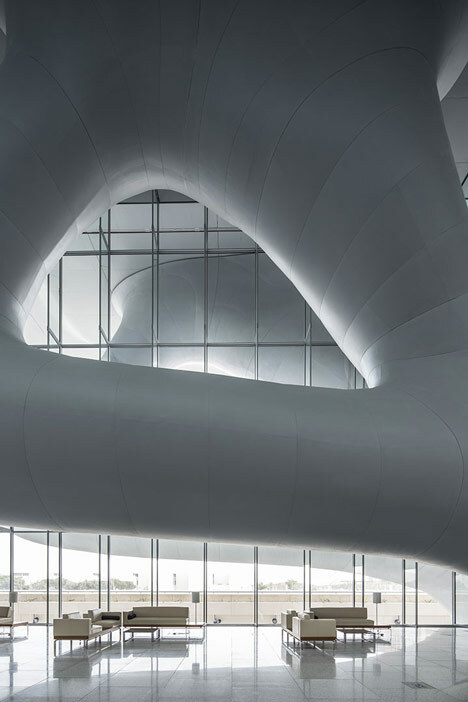 Visitors enter the building through a large reception hall that spans both the full width and height of the building. 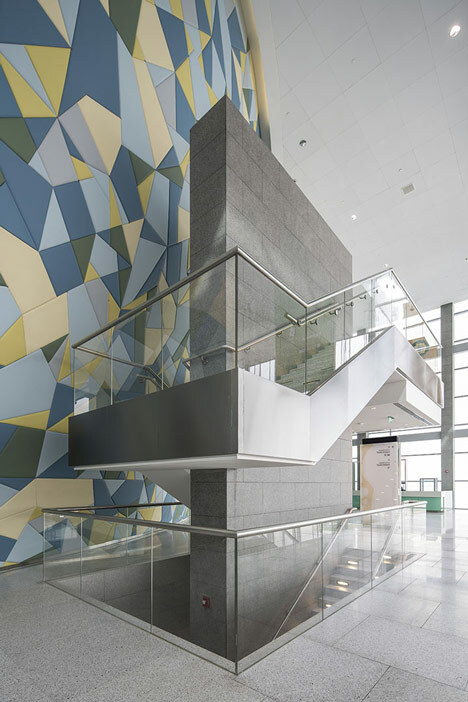 Steel-clad staircases beyond lead to floors both above and below ground, and are flanked by a wall of colourful tessellated shapes. Other spaces include a 4000-seat conference hall, a 2300-seat theatre, nine exhibition halls and a series of 52 meetings rooms that can be used for various events and activities. See more photography by Nelson Garrido on Dezeen, or on the photographer’s website. 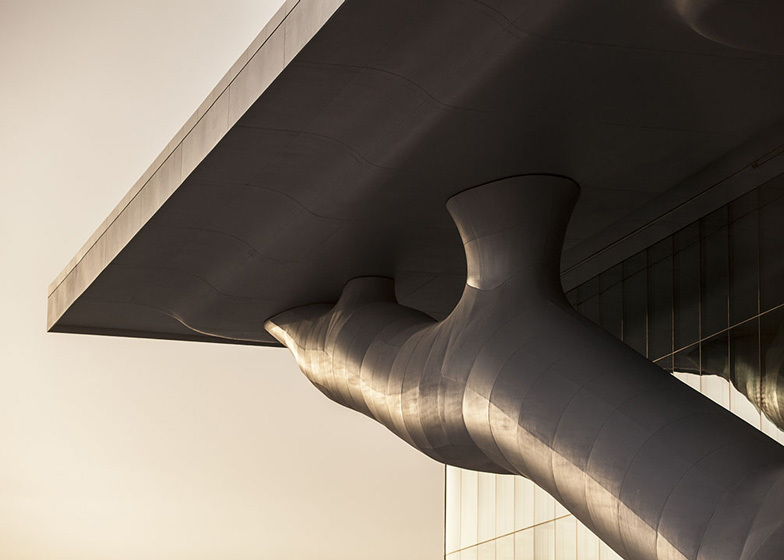 QNCC was designed by the renowned Japanese architect Arata Isozaki. 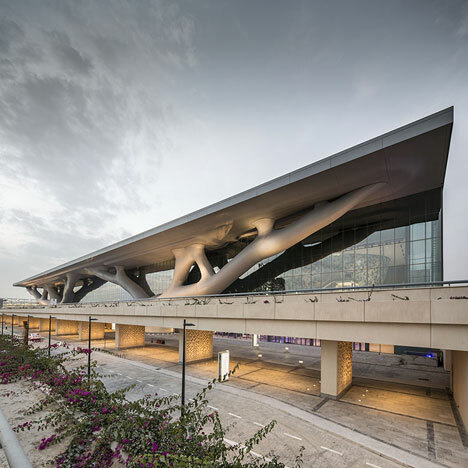 Officially opened on 4 December 2011, the Qatar National Convention Centre (QNCC) is one of the most sophisticated convention and exhibition centres built to date, boasting iconic design bearing the ‘Sidra Tree’. QNCC was conceived with a focus on sustainability. The Centre was successfully built according to U.S. Green Building Council’s Leadership in Energy and Environment Design (LEED) gold certification standards. The building is designed to operate efficiently with innovations such as water conservation and energy-efficient fixtures. 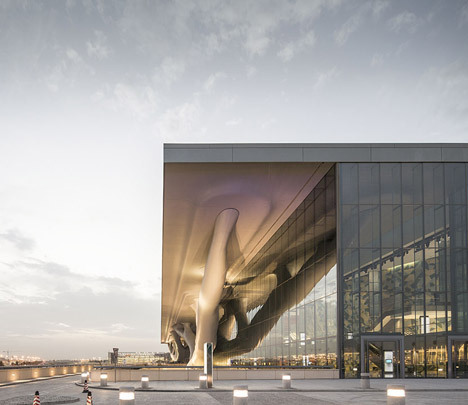 A member of the Qatar Foundation, QNCC features a conference hall of 4,000-seat theatre style, a 2,300-seat theatre, three auditoria and a total of 52 flexible meetings rooms to accommodate a wide range of events. It also houses 40,000 square metres of exhibition space over nine halls, and is adaptable to seat 10,000 for a conference or banquet. 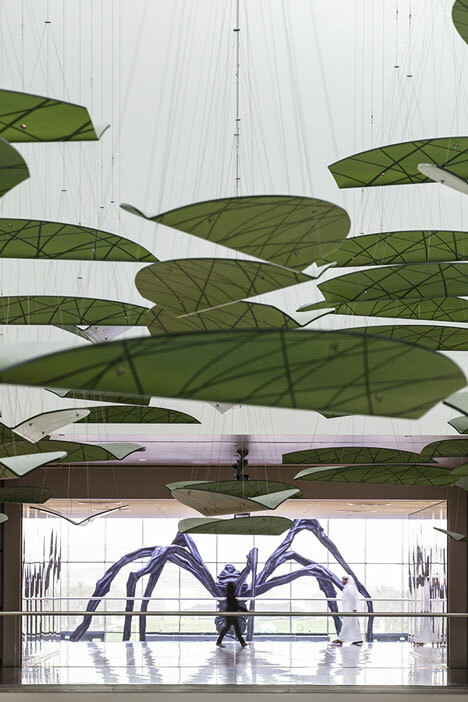 The Centre’s stunning architecture and cutting edge facilities are ideal for hosting local, regional and international conventions and exhibitions, gala events, theatrical productions and banquet functions.